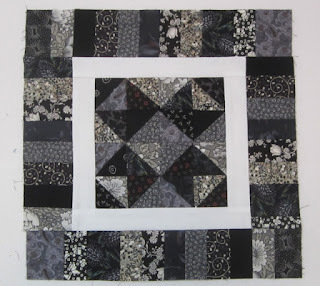 Today over at Soscrappy is another Scrappy Saturday and this months colours are Black and Grey. I did not think I had so many scraps in this colour but I do have lots. 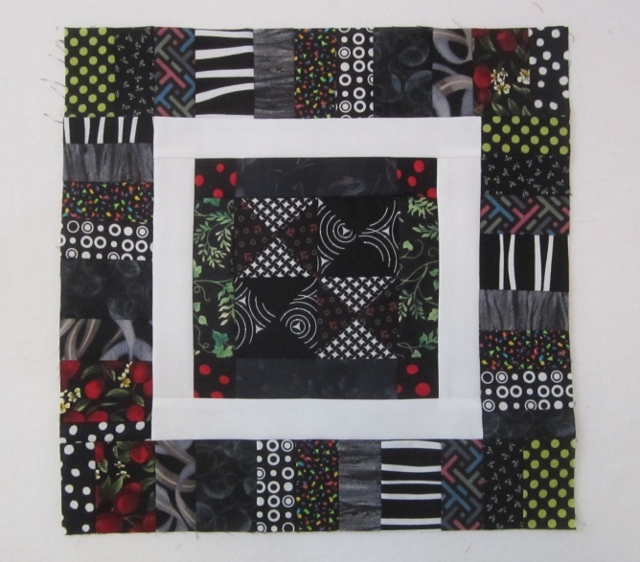 I have a basket full of just Black and White yardage but have worked to keep the scraps down ( I thought). I look in another box or bin. I find more. I have allowed a bit of colour or a bit of white in so it is not to flat or boring. 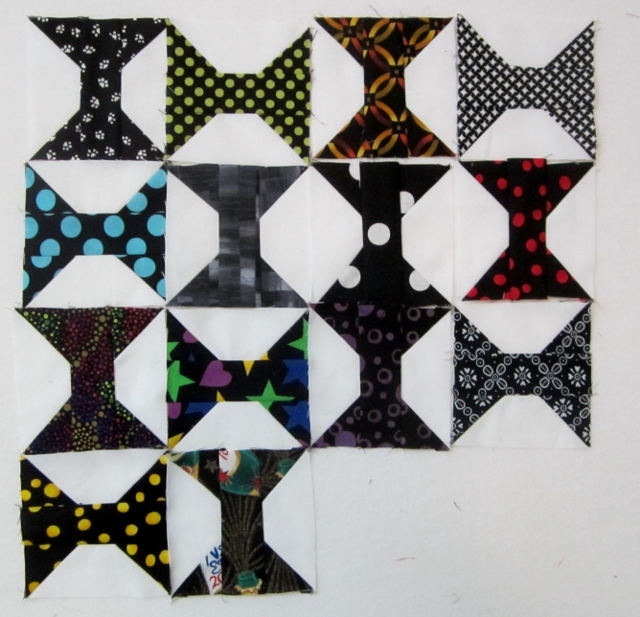 This first block has colour and some white and very little grey. 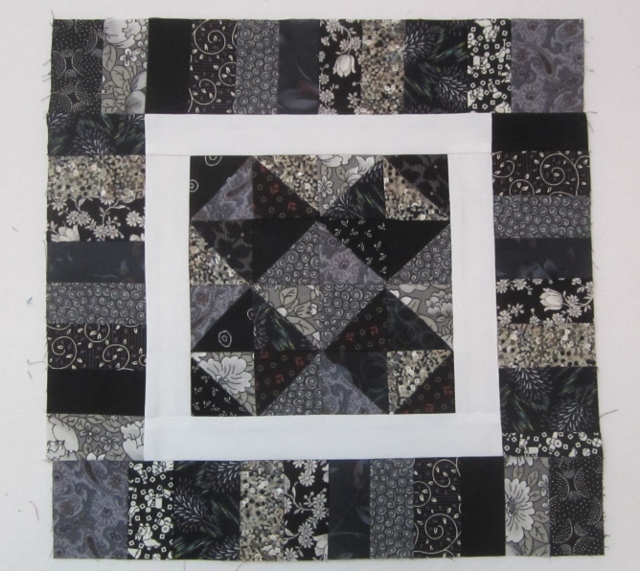 This block has very little colour but lots more darker grey. I like that they are different but the same. 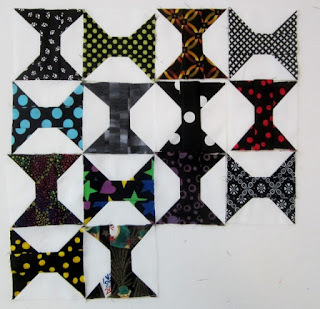 These are the spools I did this week as Leaders and Enders, from Bonnie Hunter's challenge. I dyed a black with white dot fabric and made the blue dot fabric some time back. I like it. I am looking forward to getting back to more colour again. 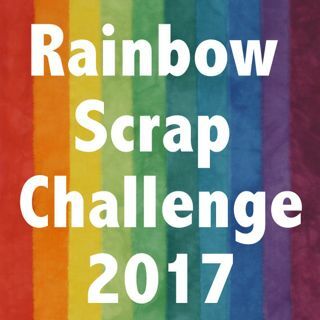 Next month we are to work on putting together some of our rainbow quilts from the Rainbow Scrap Challenge 2012. I am already looking for ideas for next year. I have ideas for two blocks I might do already. I can also get back to my farmer's wife blocks too. I need help with ideas here. I have a set of four old chairs that were my Grandmothers. I need to leave the brown wood finish (long story). But the seats need work. I once thought I would rug hook seat cover but my wrist does not like hooking. 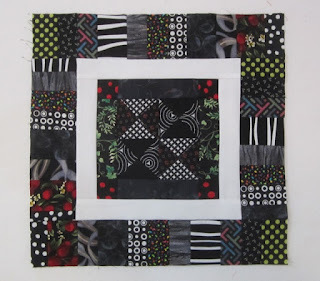 Now I think I should do some patchwork, but what. My room gets lots of light and fading can be a problem. They are not square so just square or triangle may not look good. Help! Your blocks look great! You have included lots of variety that's for sure. I don't know what to suggest for the chairs other than some sort of tapestry/needlepoint design. 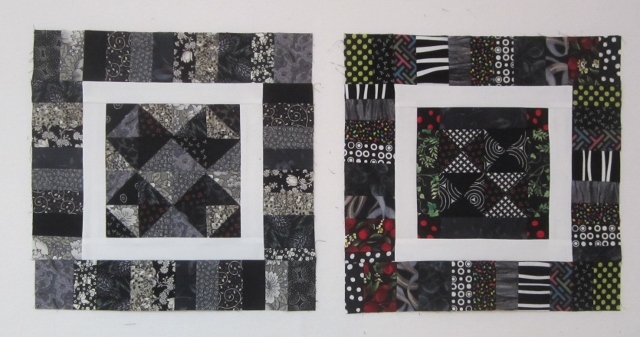 Beautiful scrappy black blocks, all of them. What about wavy or wonky stripes? I saw some nice wavy stripes on a blog somewhere recently, but now I can't find it back. 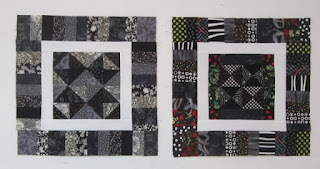 Love both of your first blocks, but of course my favorite is the one with the little surprise touches of color :*) The black/gray one is gorgeous too with an elegant feel to it. And your little spool blocks are just simply too cute! Love your black and grey with a bit of color, very nice. I like your black blocks. The spools are just adorable. How about Rob Peter to Pay Paul done in solids? Great blocks! The bits of white and colors do make them more interesting. Don't know what to say about the chairs. I hope you will blog about how they turn out. Love all your blocks! So fun how the two blocks are similar but so different! Re: chair...I'd just use upholstery fabric, maybe something reminiscent of your Grandmother's era? Hi, Cathy. Love your black and white blocks. They are such eye-catchers. 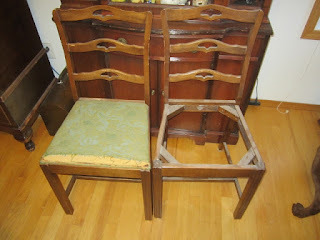 As for the nice chairs, you could do a stripe patchwork in light colors, which would fade less. Have fun with them! Great use of blacks and grays. My immediate reaction to your chairs was tapestry...what about a nice upholstery fabric in a tapestry design?